« Beech Park Vegetable Allotments, open day. A lot of new houses build as part of estates have gardens you could not swing a cauliflower in, never mind a cat in. For the most part these also tend to be dominated by paving and gravel rather than fertile soil. Then there are the apartment balcony gardeners who despair as they dream of growing a few humble veg, twenty, thirty, or forty feet above Terra firma. There is a way around the space issue though, one that will allow you to grow your own salad bowl staples, and all you need is a free windowsill or two facing any direction except north. Fully loaded, but it could be veg in these boxes rather than daffodils, photo / pic / image. Advantages of growing in containers. (1) You have control over the growing medium (soil/compost); for the most part you dictate how much water and fertiliser it receives. You will also be working with “virgin” soil, full of growing goodness in both texture and nutrients, and free from weeds and pests. (2) Window box veg works well for access by gardeners in a wheelchair or those who have gardened too much over the years and have a bad back or knees as a result. No stooping needed. (3) If growing your vegetables from seed, you can get them off to a flying start by growing protected on your indoor windowsill, and then gradually you can move the window box to the outdoor sill. 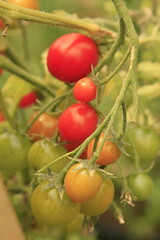 Cherry tomatoes, photo / pic / image. 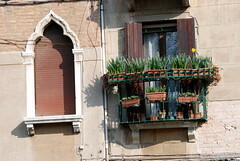 (4) Trailing plants of both the vegetable and fruit kind can be displayed more effectively if allowed to tumble from a raised window box. Strawberries and cherry tomatoes come to mind. (5) In many ways it is easier to control pest damage to vegetables in window boxes than those at ground level. The carrot root fly for instance cannot fly above 60 centimetres (approx 2ft), so his eggs, which later turn to tunnelling maggots, never trouble window box carrots. Slugs as well have farther to travel, right up along the side of you house to get to your veg, where you will have a scattering of salt waiting for them on the sill if your feeling particularly malevolent. (6) And finally in winter when many vegetable gardens tend to look a bit shabby, you can slide the container off your windowsill and move it to a frost-free area, something you cannot do with traditional veg patch. Disadvantages of growing in containers. You will need your watering can for containers, photo / pic / image. (1) Frequent watering is required; you cannot just rely on rainfall to top up container moisture levels for you. (2) Because root systems cannot grow beyond the confines of the window box you will be slightly limited in the varieties of vegetable you can grow. You will not be ruling certain vegetables out completely, however you will have to select miniature, compact versions, those specially bred as space savers for gardeners with limited space. More on these container vegetable varieties in my next post, plus how to prepare, fill, plant and maintain your veg window box. photo credit 1: Kevin H.
This entry was posted on Sunday, March 22nd, 2009 at 8:02 pm	and is filed under Uncategorized, Vegetable garden tips and advice.. You can follow any responses to this entry through the RSS 2.0 feed. You can leave a response, or trackback from your own site. Thanks for the mention! I think one thing to keep in mind is that a lot of people who turn to container gardening do so because they are restricted by the space available to them - a yard, a fire escape, a roof - whatever it may be. From my experience, I would definitely say make sure you do your research and heed advice from those with experience in the area. If you ignore some advice just because you have your heart set on a particular vegetable, you may find yourself disappointed with yield. Doing a bit of extra research also helps maximize your success rate. Us container gardeners can’t always rely on trying a variety and seeing what does and doesn’t work due to the limited resources available.